Would you like to travel back in time with me? Let's rewind back to July, in the middle of summer. This is when magazines tend to prepare for their fall issues and everything must look fall appropriate... even when it's a balmy summer day outside. It's quite an experience and I was fortunate to take part of it when The Nest Magazine editors asked if they could feature me for their fall 2009 issue. I'm an active member of The Nest, a website dedicated to married women. As a contributor to the What's Cooking community forum of The Nest for the past few years, I soon learned that The Nest folks took interest in me and my blog. Before I knew it, they asked me if I would be interested in being a 'guest chef' for their upcoming fall issue. How could I pass up such an opportunity?! I got a mention on the magazine cover! Once the editors decided on which dinner dilemma they wanted to feature, it was up to me to come up with recipes that solved the dilemma. I had about 24-48 hours to develop a recipe that resolved each dilemma and they had to also be appropriate for fall! (That was a challenge since I was enjoying summer ingredients and flavors at the time.) Fortunately I work well under pressure and the recipes I came up with were submitted to the editor. After a few revisions on wording and clarification on measurements and ingredients, we were ready for the on-site shoot. Let the fun begin! The day started with a makeup artist to do me up. Maggie Kerr was my makeup artist for the shoot and came in from Wisconsin. Originally based out of San Francisco, she's been in the fashion industry for years as a model and now as a makeup artist. Maggie's also quite a foodie herself so we had a lot of fun sharing restaurant experiences, recommendations and places around the world for good food. She was the first person I worked with since she helped me get ready early in the morning with makeup. As I was having my pictures taken throughout the day, Maggie was always close by to do touchups as needed. 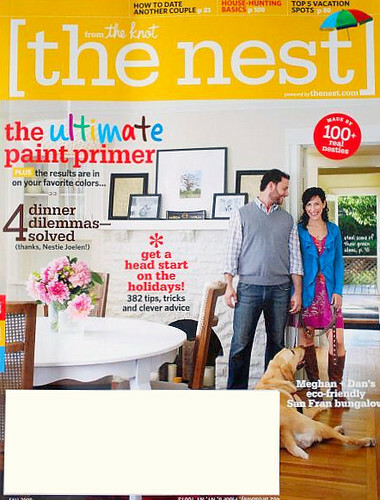 Next person who was part of The Nest Magazine shoot crew is a local Chicagoan, Andrea Kuhn, the prop stylist. Andrea's work can be seen on Bon Appetit magazine/website, Cooking Light magazine/website, along with many more and she's even worked with Ina Garten and Gale Gand among others. As a prop stylist, Andrea has a great eye for adding props to a photography shot, whether it's for a magazine, book, or even online site. She provides a bit of texture, shape, color, and overall vibe to a photo with the use of props.... and she had a lot to choose from for our shoot! Being that this was a fall issue, Andrea and her assistant had some great pieces that worked perfectly for the magazine spread, incorporating lots of fall colors. From Andrea, I got to learn a lot about capturing the best possible shot with food and how props can certainly make a difference. Although food is the star of each photo, the presentation and props are just important. I hope to continue to improve my food styling and apply what I learned from Andrea with my own pictures I take for my blog. Another key player is our photographer, Mark Lund. Mark flew in from New York and has worked with many, many clients for their advertising and editorial needs, along with working with a few agencies. Aside from The Nest, you can see Mark's photography work Cosmopolitan, In Style, People, Real Simple, and quite a few more. Mark and his assistant had quite a bit of photography gear. Everything from tripods, diffuser screens, mega-monster cameras and high tech photography computer programs were used for the shoot. From Mark, I learned some key tips on food photography. During this time, I was still using my Sony Cybershot point & shoot camera. Now that I've upgraded to a DSLR, I feel more confident about my pictures and have been applying some of the tips that Mark shared with me. His tips included using a tripod to help me adjust my food presentation without changing the photo view. Another was about lighting and how to capture the best possible light without using a direct flash. Lastly, one other tip was to take a lot of pictures of the same object in different angles, settings, etc. Can you believe that for all of the four dishes that were prepared for a photo, each one took about 1 hour to photograph? I was in awe with the amount of detail that was paid to each dish... especially when working with both a food and prop stylist! my Tortilla Espanola recipe featured on page 69 of The Nest magazine. Mark was kind enough for me to take pictures of some of the set ups with my piddly point and shoot (I felt so inadequate with my camera compared to all his gear...) Here are pics I took of my Maple Salmon over Nutty Couscous, recipe featured on page 68 of The Nest magazine, however Mark's picture in the mag is gorgeous! The person who really made my recipes shine is Jeremy Bringardner. He was our food stylist and was responsible for preparing my dishes as written and working with both Andrea and Mark to capture the finished dishes for the magazine. Jeremy is based out of Chicago and has worked with some amazing chefs including Charlie Trotter, Jean Joho and George Germon, to name a few. You can even see his work in print ads and online marketing for clients including The Knot.com, Albertson's/Jewel, and quite a bit more. If that wasn't enough, Jeremy even has his own catering company, Modern Catered Cuisine (MC2). Jeremy did a fantastic job preparing the recipes while I looked on. It's important that the recipes really work as written and no crazy food styling tricks were used for our magazine shoot. Jeremy brought all the ingredients for the recipes, prepped them and cooked them as written for the magazine. What you see in the magazine spread are tried and tested recipes that I created. So what recipes did I come up with to solve the four dinner dilemmas posed by fellow Nesties? "[What can I make for] a romantic dinner on a budget?" "[What can I make for] a healthy dinner that's actually filling?" For this dinner dilemma, I created a Maple Salmon over Nutty Couscous. Seafood is a great way to take a healthy break from beef, pork and chicken. I chose salmon because it pairs well with a favorite fall flavor of mine, maple. To add some contrast in texture and compliment the maple in the dish, I added walnuts to couscous, although you can also use almonds, peanuts, pinenuts, etc. This recipe is featured on page 68 of The Nest magazine. "[What can I make for] a fast and filling appetizer made with kitchen staples?" For this dinner dilemma, I created a Tortilla Espanola. I'm a fan of trying out different kinds of cuisines to break away from the usual recipes in my rotation. One of my favorite cuisines is Spanish and they certainly know their appetizers or tapas. A popular Spanish tapas dish is a tortilla espanola and incorporates potatoes, eggs and ham. With a short ingredient list, you're able to whip up a quick appetizer with some Spanish flair using what you have on hand. This recipe is featured on page 69 of The Nest magazine. "[What can I make for] a vegetarian dish a meat & potatoes spouse will eat?" For this dinner dilemma, I created a Baked Portobello Parmigiana. My husband is definitely a meat and potatoes (er, rice) kind of guy and meatless meals can be a challenge. One ingredient that's a great meat alternative is portobello mushrooms. Taking the classic idea of chicken parmigiana, I used a portobello mushroom instead and it provides a great meaty texture with delicious depth of flavor. This recipe is featured on page 69 of The Nest magazine. So after spending a whole summer day with the crew to create this magazine spread, I had to keep the details under wraps until The Nest Fall 2009 Magazine hit the newsstands. Now that I have my copy in hand, I'm able to take you back in time and share the whole experience. If you happen to see the magazine, I hope you pick it up and take a peek! Aside from the my recipes, there's quite a bit to read and learn from, whether you're married or not. Thank you to Maggie, Andrea & assistant, Mark & assistant and Jeremy. It was a pleasure to work with all of you on this magazine shoot and I learned so much from each of you! For a crew of individuals who have never worked together before, there was such a great sense of teamwork and I'm happy to be a part of that experience! And a special thank you to Anni, Rebecca, and Riann from The Nest. It was an honor and pleasure to be featured in your magazine and I look forward to the great things The Nest has in store in the future. Very cool! What a awesome experience. how cool! what a great experience. Congratulations! How exciting! And your ideas sound delicious too! How awesome is that...what a wonderful experience! Awesome! You were a great choice for this! Congratulations again Joelen! You've had some really amazing experiences lately - I think all your hard work is paying off! The dishes look and sound great (and btw - I love your necklace!). you have arrived, old blog friend! i'm not around much anymore but i'm always following your blog. This is the coolest thing ever! So proud of you! This is awesome! Congratulations on your fabulous work! Congratulations on being featured...I can't think of a more talented and deserving person for them to pick! How neat, I can't wait to see the mag in person! Congratulations on being featured! And thanks for blogging about the experience, it was fun to learn about what goes on behind the scenes! That's so cool!! You were the perfect person to be picked!! I can't wait to get my hands on a copy of that! Wow!!! That is sooo cool!!! Congratulations! That's an awesome experience! What an awesome experience! Congratulations!! Congratulations! Thanks for sharing your experience. Wow, what a cool experience!! Congrats, all your recipes sound great! Wow - what a great experience. Your recipes sound really good! What a compliment- the photos and food looked delicious, as always. Congrats Joelen! Awesome! I'm so proud to know you! :) I'll have to go get a copy. This is so exciting! Do you know where I can pick up a copy of the magazine? Is it available in most stores? This is soo cool! I never got my magazine... I'll have to try to subscribe again! hi again joelen - i tried looking for the nest at my local borders but they didn't carry it. do you know where else this magazine can be found? Having followed you on the What's Cooking? board from the start--i'm so happy we could feature you in the magazine! Congrats! What a great experience and your recipes look fabulous. Congrats, Joelen! Sounds like an awesome experience, thanks for sharing. How cool! I'm totally behind on this but congrats! I'll have to look out for a copy.